I bought an old AMF American Speedway arcade game which I am slowly bringing back to life. I believe that only a few of these were ever manufactured (mine is serial number 17) and would love to get it back to its former glory. Unfortunately I need two things to complete the game. I only have one car, so need another one, and I don't have any schematics. Does anyone have these items or know of someone who might have these two items for sale? Really cool find. I sent Peter Lentros a link to this thread as he might have the schematics. I may have a car but need pictures of your car to confirm. I never heard of this, but I did a really quick search and found this LINK. Although your picture looks just like one of the ones on that page. There's a reason for that... LOL. I searched up a couple of pictures from that same page and added them to Gordon's post. I had heard of this arcade game before but couldn't recall what it looked like, so decided to add some images. That is really cool piece of history. ill try post some pics of what I have so you get a better idea of what im trying to revive. The existing car is currently not in hand as I gave it to someone in UK to try copy it but will try to get some pics anyway. Wow. I've seen a lot of things in slot racng over the decades, but had never seen or heard of this. If the original cars are like the ones in this thread I have several, plus spare parts. The 'system' looks like a prototype for the eight lane version. Each curve and straight are on separate (A/B/C) circuits so that you must turn the wheel to engage that power circuit.. If the track power is 8-12 volts DC, then any correct size car will run on it. This is what I have in hand right now. Everything seems to be intact but the car is in a bad state and a schematic would definitely come in handy. It probably has been here - or OWH. I remember seeing it in the past. Sorry, but that is not an original car for this track. Would like to see the chassis as well, but that is a Cox Chaparral 2D body. Edit: In fact, might be a very rare 2D IFC body! Screw holes look to be in the right spot. Looks like the Iso version, doesn't it? Guide extension is something else and there are no screws in the sides. Who knows what is under that body! Looks like the flat section of an Iso frame behind the front wheel. That picture actually makes the wheelbase look OK. The wheelbase is kind of fishy-looking on the real deal. Front and rear wheel arches have been enlarged. At least toenail clippers weren't used! In this pic you can see the cars are open sports cars on the track. But the artwork is the Mako Corvette, more than likely the dual guide rental car. I wonder what the game came with. I would guess the Mako? Did I see a selenium rectifier? A selenium rectifier is a type of metal rectifier, invented in 1933. They were used in power supplies for electronic equipment and in high-current battery-charger applications until they were superseded by silicon diode rectifiers in the late 1960s. I replaced one in a Lionel train voltage controller with a modern-day four-diode rectifier. Hung a big capacitor on it and had a pretty good power supply for up to 2 amps. Good luck reverse engineering a schematic from those pictures! I don't see the mentioned selen rectifiers. 1) Looking at the system in general, there are 15 lamps to indicate the progress (the lap counter !) for each car. ​I believe that is handled by the two systems marked "A" and "B". 2) The mechanical rotor "D" is propably the overall time keeper and propably also responsible for driving the car "Home" after the end of the game. 3) The six relays marked "C" are propably supplying power to the "Right," "Left," and "Straight" for the RED and the YELLOW car. They are controlled by the steering wheel and supplies power to the segmented braid on the track. 4) "E" seems to be four identical systems with a power resistor, a capacitor, a second smaller resistor, and propably a single transistor mounted on the cooling aluminium bracket. I think they are transistors because of the three wires. It could possibly be part of the DC power supply system. 5) "F" is another motor driven "thing" with microswitch sensors. I am not entirely sure what the purpose of this might be. 6) I am missing a device for handling the two digit "7-segment" displays. I assume they would count time? Convert AC to DC - one rectifier (#19 - F) and transformer circuit on a master switch. Two switches more for each lane power for one or two lane operation. From Post #12, Picture-3 and 7 (and some of the instruction text), I conclude the counter to be from 1 to 15 laps being counted as a running light on the lower part of the glass display. ​This also match the 15 wires attached to component "A" and "B". The two-digit 7 segment display indicates the "Winner's time" in seconds according to the ledging. ​It could be implemented as a mechanical device with rotary wheels and switches, but there would have to be 2x7 switches and wheels to make it work. ​I don't see a component that match that. Could we have more pictures of the internals of the beast? It is quite interesting to see this kind of mechanical programming. I personally think I need two Makos to complete the set. Took pics for a better view of " The Beast " for whoever is interested. Can you tell if the track has standard routed slots, or T-slots that the monster guides lock in to? If it's T-slot there should be an obvious area where the cars are 'clipped in' so they lock into the groove. The track has T-slots so that the car can never go off track since its closed with a glass cover. 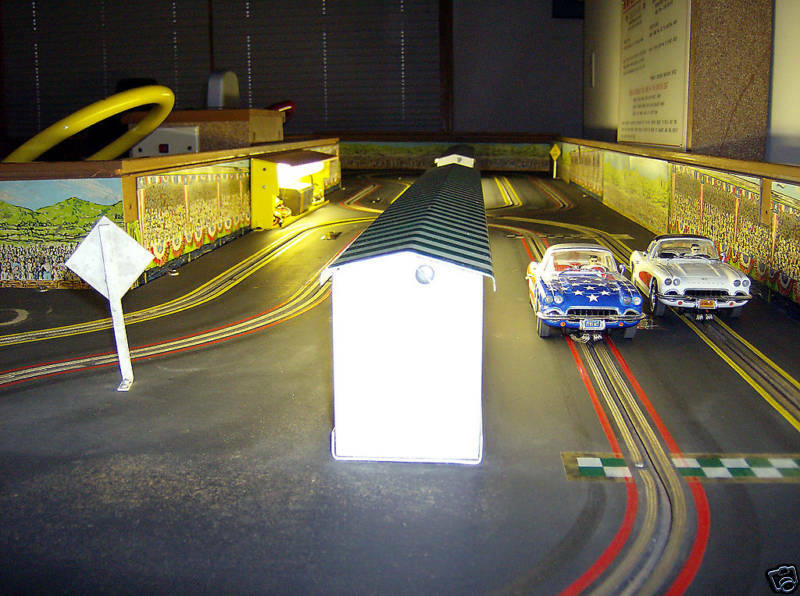 The cars can be slotted at the intersecting part of the track.